Bring your living space to life with Krylon® Spray ‘n Peel. Make sure planting containers are clean and free of debris to insure smooth coverage. Using painter's tape, cover any areas that will not be sprayed. Make sure tape has a tight seal to create a crisp line. Spray uncovered areas with Krylon® Spray 'n Peel in Matte Sun Ray. Repeat this step, spraying multiple layers until coverage is consistent. Add rocks to bottom of container, followed by a layer of succulent soil. Break up roots of succulents, and plant in the soil making sure the roots are in the rocks. 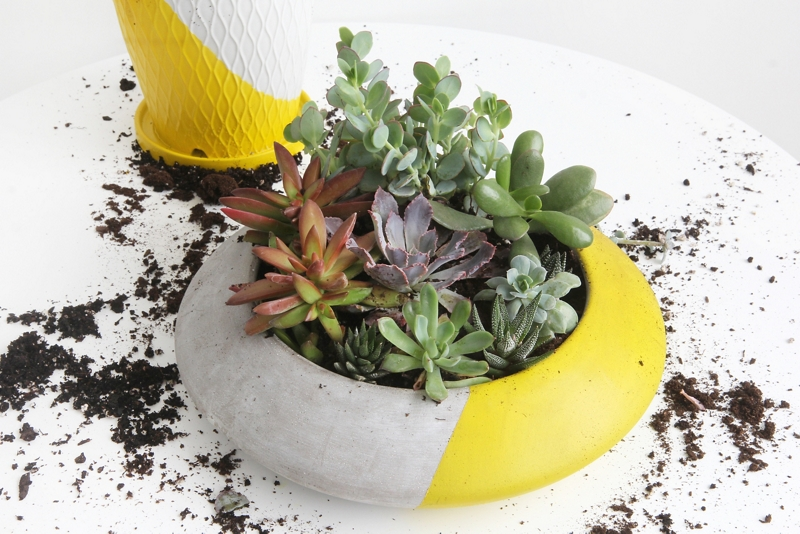 Once succulents are in place, fill with soil, and top off with pebbles.